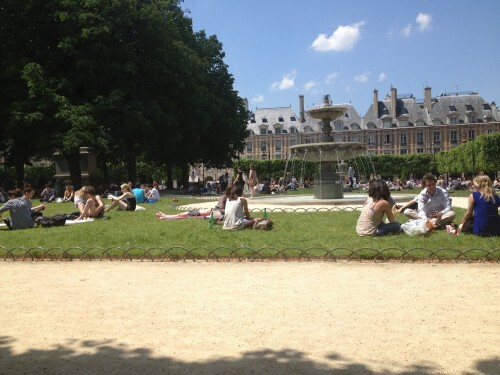 Below you’ll find our suggestions for where to pick up cheese, sweets, wine and other picnic provisions before settling in for an al fresco feast at Place des Vosges. Pascal Beillevaire – A producer of cheeses, plus excellent butters and other dairy treats. Pain de Sucre – A lazy picnicker’s dream come true, selling pre-packed sandwiches, cold salads, savory stuffed breads, and baguette. On the sweet side, you’ll find multicolored marshmallows, stellar macarons and ice cream to go. L’As du Fallafel – Cheap, messy and seemingly obligatory. The line-averse should probably avoid it on a Sunday afternoon. Gérard Mulot – This traiteur/pâtisserie/boulangerie offers a visual feast of grand cakes and tarts, tiny and tempting petit-fours, chocolates, savory prepared foods, and baguettes to boot. Miznon – This annex of an Israeli chain has above average, far more creative offerings than your corner kebab stand. Notable options include grilled cauliflower, grilled sweet potato, and beef bourguignon. Pain de Sucre and Gérard Mulot – see above. Carette – A beautiful, old-fashioned pastry shop. Josephine Vannier – Near the Places des Vosges, Vannier offers playful chocolate sculptures and a range of bon bons. Dalloyau – This historic traiteur and pâtisserie invented the oft-imitated Opera Cake. Les Caves du Marais – Crates and bottles are piled high in this bare bones shop, run for more than two decades by Jean-Jacques Bailly, who offers good prices on estate bottled wines from all over France. La Moustache Blanche – Hipster beer geekiness pervades this shop boasting more than 500 beers from all over the world. Featured prominently are craft beers from the United States & Northern Europe, plus Belgian Trappist and Abbey beers.